The Battle Royale genre has been exploding thanks to the popularity of Fortnite and PlayerUnknown's Battlegrounds. The latter has passed sales of 21 million thus far and has been nominated for Game of the Year at this year's The Game Awards, hosted by Geoff Keighley. And the former, we've just learned during The Game Awards airing, has hit a new high of 30 million players along with a concurrent players record this past weekend of 1.3 million. Additionally, the team at Epic Games used the awards show tonight to unveil a brand-new 50 versus 50 mode for a limited time. While the Battle Royale sector has become fiercely competitive, there's a pretty important difference between PUBG and Fortnite in that the Bluehole published game costs $30 whereas Fortnite's Battle Royale is 100% free-to-play. And much like Warframe before it, Fortnite is handling free-to-play the right way. "Since the beginning we've said we don't want to offer any gameplay affecting items, and that's really the foundation of our free-to-play model," Eric Williamson, Lead Systems Designer on Fortnite Battle Royale tells me. "It's crucial that we can't undermine the competitive aspects of Battle Royale, and so the types of things we offer need to conform with that pillar. We've also made a decision to sell items directly - if you see something you like, you can just go to our store and get it." It was not even 60 days ago that Fortnite had reached the 10 million players milestone, so how has Epic managed to triple the base so quickly? "To us, games-as-a-service comes with a few obligations. Rapid updates is a big part of it, but it's also about being able to address concerns quickly"
Williamson comments, "The velocity of the team and the rate of updates are something we're very proud of. After we built the core framework of Battle Royale, we realized we have a tremendous opportunity to continue to iterate and improve on the core gameplay experience. We've been aiming to release a meaningful game update in addition to quality of life improvements every week. The Bush, Launch Pad, Smoke Grenade, Suppressed Submachine Gun, and there's others too. This has definitely presented a lot of challenges, but we've been so excited to see how strategy evolves with each addition. "Some of our more emergent gameplay has also been an incredible benefit. Rocket Riding (where a squadmate shoots a rocket and you can ride on it if you position yourself just the right way) was discovered by the community, and that's not something we had originally intended. People loved it; we saw some amazing gameplay and clips, and they were just having so much fun. So we said, what the heck, it doesn't really break the game that much... let's support it." 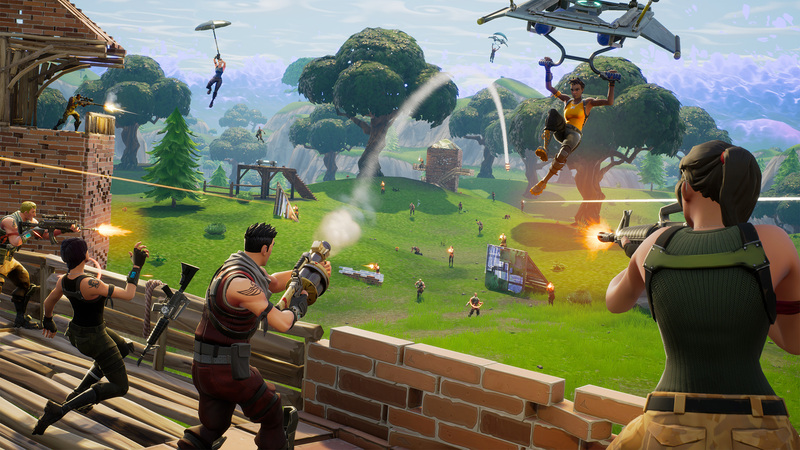 That attitude and immediate responsiveness to the community has been a key for Fortnite, and it's ultimately the approach that developers serious about games-as-a-service have to take if they want to succeed in today's market. "We're really taking this part seriously," Williamson asserts. "To us, games-as-a-service comes with a few obligations. Rapid updates is a big part of it, but it's also about being able to address concerns quickly. A large portion of our game data can be hotfixed within minutes if we identify a game-breaking issue, for example. This allows us to address balance or other issues if something unexpected comes up. We've done a number of hotfixes to address community concerns. "Communication is also crucial. We have a very, very open and transparent policy with our community - through our forums, Reddit, Twitter, and other social media channels." You might wonder why Fortnite's new 50 versus 50 mode is only playable through Sunday, December 17, but in true games-as-a-service nature, Williamson says that his team is eager to test out a number of different modes with the player base. This sort of open experimentation will let the developer see what players react to most, and there's no stopping Epic from turning a limited time mode into something permanent if it's wildly popular. "There are many other exciting limited time modes we'd like to explore down the road," Williamson says. "This initial step will give us the framework to try all of those other ideas, without committing to any of them permanently. Of course, if there's enough of a demand for 50 versus 50, we'll re-evaluate how often it's available." One feature that Epic and players would still love to see is full cross-platform play across all consoles and the PC. Sony has been a standout, resisting cross-play between Xbox and PlayStation, although it accidentally was turned on in September, and at that time, Xbox boss Phil Spencer commented that he wished it had been left on. Williamson remarks, "We love cross-play - people have friends on all different platforms. Games are so social now that knocking down the barriers and getting everyone into the same game just makes sense. Obviously there are some tough issues to work through, but we'd love to live in a world where those constraints don't exist." During The Game Awards, Epic's worldwide creative director Donald Mustard was asked about cross-play as well; he says gamers deserve it and that Epic will do everything it can to make it happen. Of course, as Fortnite continues to gain in popularity, there's always the risk that a subset of the audience could taint some of the experience for others with toxic behaviors. Online toxicity is a problem for most competitive titles now, unfortunately, but Williamson says the studio is watching closely and trying to keep a handle on bad behaviors. "There's a number of methods we're using the reduce the impact on our overall experience," he notes, "but to avoid undermining any of our efforts, we'd rather not talk about specifics. I will say we've been constantly evaluating and improving our methods to deal with toxicity. However, the one thing I do suggest: if a player witnesses toxic behavior in-game, please use the player report feature." Glad they called out Sony on Crossplay.